Tag Archives for " peep.ly "
Marketing today means building a great deal of your thinking around a total web presence. I suspect you’ve heard this before because this idea is one that is being voiced by just about anyone that’s online today, but I encounter business owner after business owner frustrated with trying wrap their head around this idea in a practical sense. For today’s post I would like to outline what I think is a very practical and doable approach to building your total online presence. You can build your web presence out fully by taking action in each of the five station of work below. Think of each station as a bucket. You need to start adding to each bucket in a systematic way, but don’t try to fill one bucket before you move to the next – put a little in each bucket and keep returning. This way you’ll build momentum in the short view, while building value in the long view. Your online marketing will benefit greatly when you take the time to monitor what’s being said by others. Creating an automated way to do this, something I call a listening station, is a base strategy these days. Use tools like to Social Mention and Postling to get deeper analysis of what’s being said – even on review sites like Yelp! I’m going with the assumption that you have web content that describes your business, tells your story, outlines your products and services and maybe even showcases a few client success stories. That’s good, that’s a start, but now you need to go to work on consistent content creation – the kind that builds trust, draws links, and educates. That should get you started, but expand your thinking beyond the action steps above. In fact, share more action steps in the comments here! I wrote and article last week for AMEX OPENForum about appending your customer and prospect lists with social network data to create a much more complete picture of a prospect. My guess is that most CRM systems and software will bake this in as a standard feature by the end of this year if not already. I believe that the ability to layer a person’s social graph on relationship building activity is one of the most valuable marketing opportunities to spill from the widespread adoption of social tools. This trend will eventually become a part of how we as consumers begin to make decisions about the people and companies we choose to do business with. 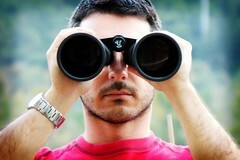 Instead of companies finding more about prospects, prospects will see who in their social network knows a good attorney. We’ve done this informally for years, but now the data is there to automatically mine. This form of social surfing will enjoy a major boost when a visitor can stop by any real estate agency or law firm web site and turn to the listing of agents and attorneys and bypass the pretty pictures and fluffy bios and simply hit a button to see who in their LinkedIn of Facebook network knows any of these folks. That day is here in limited applications, but I predict this is functionality that will soon be a standard web site feature. 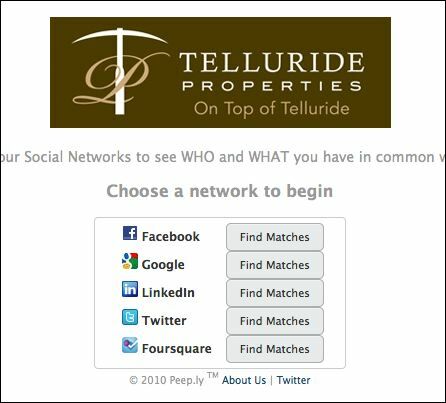 Colorado start-up Peep.ly is still in private beta, but you can see its social surfing option in action at Telluride Properties (click the agent match link). Imagine what a powerful tool this will be for someone shopping for an agent. With the click of a button they can scan their own networks and evaluate which of the agents they may already have a connection with. This will dramatically impact referral and lead generation. 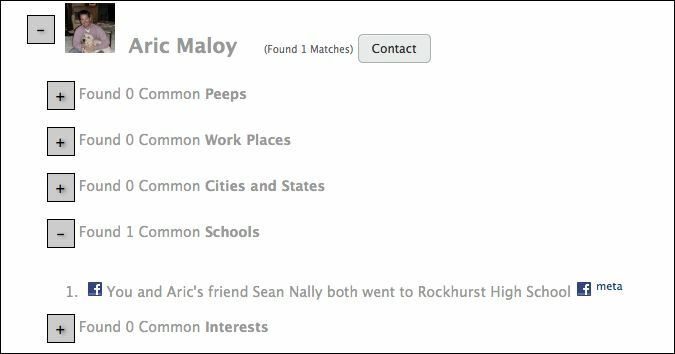 Even the business with only one employee could easily offer this kind of functionality so that when someone refers them a potential prospect could visit the web site and see who know who. Of course, once this form of social connecting is commonplace it will also be a great tool for a sales person doing some research. If I’ve got something I want to sell someone having a quick way to scan and find our common connections might make it easier to get referred to them. It’s tempting to call this another social media tactic, but in reality, this is just where we are headed with information and participation in the world of marketing.